In January 2014, seven years after I’d opened a Facebook account, I commented that it almost felt like I had to hold my nose when I logged in (my 2014 column in LMD was titled ‘Is it time to quit Facebook?’). It was communal – in parts. But the network with more people than the population of several countries combined had morphed into a bragging tool, a showcase for egos and a nonstop personal PR machine. Had I joined some sort of a mutual admiration club? A few months before the Cambridge Analytica earthquake in March this year, I once again felt the need to pull the plug. I’d been running into alarming studies published in neuroscience circles and hearing paediatricians warning us how social media was becoming addictive among young people. These concerns were not academic. Soon, former Facebook insiders began echoing this truth. To be fair, Facebook is not the only reason the fabric is in disrepair. We need to factor in how news media works and how mobile communication has accelerated the spread of information. What is new however, is the ability of social networks to surreptitiously – albeit legally –harvest user data and target messaging at end users, to overwhelm citizens with too much information and polarise issues on a massive scale in the moment. Being connected in such a frictionless way creates new kinds of frictions. “We are in a really bad state of affairs right now, in my opinion. It is eroding the core foundations of how people behave by and between each other,” Palihapitiya asserted. the world to government overreach, former Cambridge Analytica employee Christopher Wylie has made us privy to how businesses harvest citizens’ data for dubious purposes. Added to that, the Donald Trump campaign employed Cambridge Analytica. And it gets murkier (cue the scary music!). BIG DATA, BIG BROTHER In the George Orwell novel Nineteen Eighty-Four, the Ministry of Truth controlled and distorted information that knitted up the social fabric. In our world where information is freely available, it is not Big Brother that’s controlling us – it’s big data. Citizens share their data oblivious to or unperturbed by the ‘machines’ or bots that vacuum it up, and ship it off to third and fourth party operators who repurpose it into the strands that make up our social fabric. We happen to call this ‘fabric’ social media. This data informs everything from marketing goods and services, and mobilising grassroots movements, to targeting certain demographics with ideologically charged news. It’s not even a closely guarded secret. In a 60 Minutes TV interview, the Trump campaign’s digital media director openly spoke of how it let Facebook employees ‘embed’ themselves with the campaign to help them use the platform. This gave them the capacity to run 50,000 to 60,000 ad versions a day. “I think Donald Trump won; but I think Facebook was the method – it was the highway in which his car drove on,” said Brad Parscale. Which seems to reinforce the niggling feeling some of us have that Facebook is really an advertising targeting network camouflaged by its ‘social’ mission statement. To be able to accurately pinpoint its ads, companies such as Cambridge Analytica need more data – little data, not just big data, such as the time of day you call certain people, call durations and their mobile numbers. Patched together, they inform the platform of a wider circle of potential targets with similar preferences. SCRAPING FOR DATA Apparently, swooping in on others on your contact list is standard practice – ‘data scraping,’ as it is known in the industry. 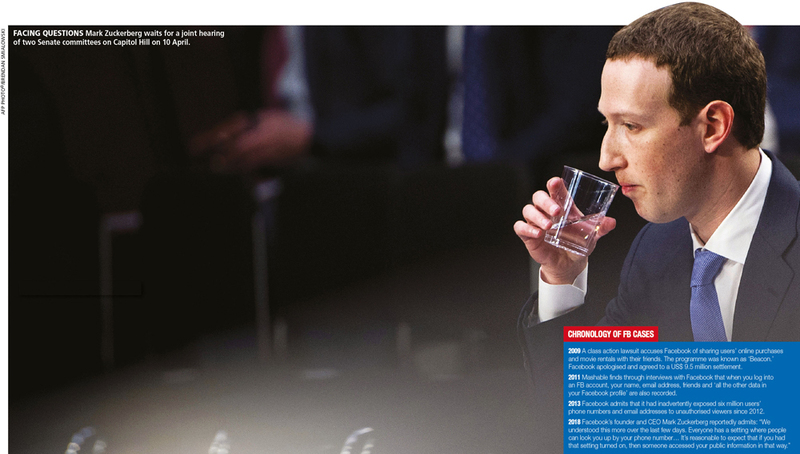 “So the first time you sign in on your phone to a messaging or social app, it’s a widely used practice to begin by uploading your phone contacts,” a Facebook spokesperson said to journalist Sean Gallagher, who inquired why his FB archive contained such call log data (in case you are wondering, if you have a Facebook account, you could access your archive at facebook.com/ messages/archived). Data scraping has been going on for years on Android devices and is also conducted by Google. It shouldn’t horrify us – after all, this is what marketers do. But it seems a violation of a user’s privacy and data for one reason: people sign up assuming that it’s a social medium, not a marketing scam. In much of the other media we obtain for free, we pay for it through our attention or data. Personally, no one holds a gun to my head to join Facebook or post anything on it. I studied in four schools, taught in two, and worked in different companies here and abroad. I am lazy, and it is a hassle to buy stamps and post letters. Thanks to Facebook, I keep in touch with most of my friends. The information we share is mostly harmless and we stay connected. I just love it! It is free and I do like the advertisements as well. I disagree that the information we share is mostly harmless. How about hate speech, which is spreading so fast not only in this country but in the developed Western world? Even the President of the United States often tweets like a spoilt child who hates everyone but himself! That is not to say that Facebook and social media in general aren’t good for the world but we must accept that they have a dark side that is dangerous, and can cause death and destruction as we have seen in many places. There has to be a watchdog but it should not be governments because that will lead to unfair censorship. How about the United Nations?